Seattle TV station KOMO this week described how an attempt to save $215 through parking lot dent repair left a woman with “a mess on her car and a dent on her wallet,” a broadcast which hopefully not only educates the gullible but converts viewers skeptical of the need for professional collision repair. The story is a good one to share with customers who question why you’re charging what you do or why auto body professionals matter. 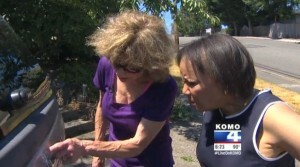 “Three guys in a black truck” gave Sandi Finley a Tukwila, Wash., Home Depot parking lot estimate for $85 to repair dents and scratches on a 12-year-old Subaru, according to reporter Connie Thompson in the broadcast posted July 1 by KOMO. A body shop had quoted Finley $300, and the men ultimately took $60 in cash after reversing their position on accepting checks, according to Thompson. The men gave Finley a business card from Mobile Mechanics of Maple Valley, Wash.. The company’s real owner, Jay Nickell, told KOMO he didn’t know how the trio obtained his card, but “I would really like to see them caught.” Nickell is a certified mechanic whose business does not perform auto body work, according to the station. The parking lot team “punched around on the dents” and applied a substance they said needed to cure for a day, according to Thompson. “This is just wax they threw on here,” Nickell told KOMO. In addition to the wax possibly being difficult to remove, the”repairers” also loosened a “SUBARU” chrome letter and dinged the finish, according to KOMO.